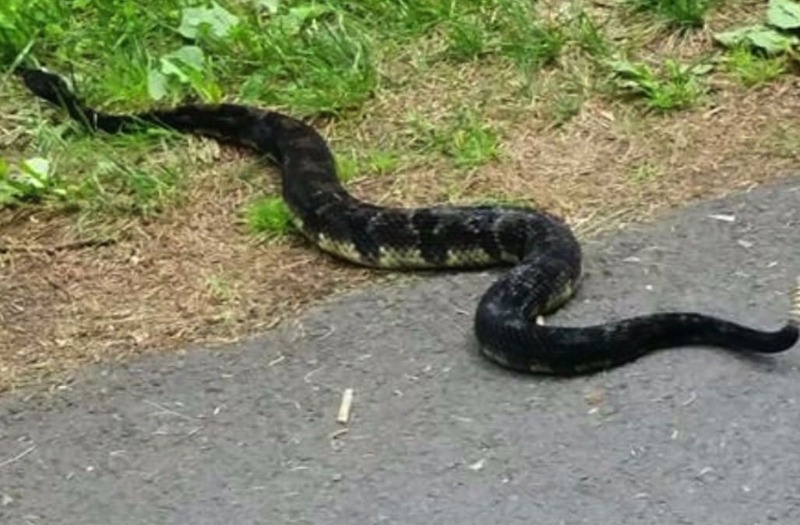 FOREST CITY (WNEP) -- Folks in part of Susquehanna County appear to have unwelcome visitors, the kind that slither and are poisonous. It was a normal Monday for Nicole Farley and her family on Main Street in Forest City. Normal until an unwelcome guest showed its scaly face. A Pennsylvania woman says she was hanging out in her yard with her kids when she saw a rattlesnake that had slithered its way into her yard and she believes a nearby construction project is to blame. "The kids and me were hanging out in the yard. They were swimming. I went to get the lawnmower from the shed. I saw it come up from the rails and trails and crossing the road into the yard," said Farley. She couldn't be sure what kind of snake it was that slithered into her backyard, so she snapped a photo and caught a rattlesnake on camera. "I called the police department and asked who could remove the snake. It was nerve-racking, told the kids to get in the house," she said. Forest City Police posted to Facebook to warn others in the borough that there could be more where the snake came from since officers believe the snakes' nests may have been disturbed by a construction project on the D&H Rail Trail that runs the length of town. Needless to say, people are leery of what could be lurking around the turn. "Ever since that rail for trail project is going on, I keep my eyes and ears open and looking down all the time," said mail carrier Lisa Litz. The stretch of the rail trail in the Forest City area had not been used to all the heavy construction equipment day in and day out. Those snakes may have been used to bikers and hikers, but the construction project is supposed to last through fall. Officials called in the PA Fish and Boat Commission to help determine if there's a significant problem and if so, what should be done. For now, Farley is not taking any chances with her loved ones. "Unless I'm there, I told them don't go out unless nanny or someone is with you because that's pretty scary," she said.